When Bishop Chilstrom arrived at Augsburg he began to realize that both his spiritual journey and his view of the world had been too narrow-minded. “I had too many pat answers,” he remembers. Augsburg professors like Joel Torstenson, sociology, challenged him to open windows to the world. “I wasn’t wealthy, but I realized I had the privilege of simply being white, and that opened doors that weren’t open for others. Joel impressed on us that we have a profound responsibility to those who did not have the advantages we had.” At Augsburg, says Bishop Chilstrom, he learned about Christianity’s call to fight injustice and how to live a courageous life. He began to develop the radical social conscience for which he later became known. Augsburg also provided opportunities to stretch his leadership wings. He became president of the campus youth group his sophomore year, and as student body president his junior year, he led the student campaign to raise funds for Memorial Library. He went on to earn degrees from Augustana Theologial Seminary and Princeton Theological Seminary and his doctorate from New York University. He became a parish minister, professor and church leader, serving as the first bishop of the fledgling ELCA from 1987 to 1995. While the family connection to Augsburg is strong, it was the nursing program in Weekend College (now the Adult Undergraduate Program) that drew Martha to Augsburg as a student in the 1980s. The program offered her a chance to earn a Bachelor of Science in Nursing (which she needed to advance her career) while continuing to work fulltime as a manager with Ebenezer’s home care and community service programs. To Augsburg she brought a passion for nursing outreach that thrived as she became involved in the Nursing Center (now the Augsburg Central Health Commons), which provided students with public health experience and helped meet Minneapolis’ growing homeless population’s health needs. She went on to graduate with the first Weekend College nursing class. Degree in hand, she continued to advance her career, which culminated in long term care insurance product development with United HealthCare. 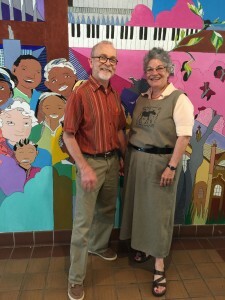 Now retired, Martha volunteers at Health Commons weekly. “There’s a lot of counseling, blood pressure checks, wound care, and foot care,” she explains. She works alongside Augsburg nursing faculty, students, and alumni, while community volunteers distribute contributed toiletries. She also supports this and other Augsburg community nursing work with gifts to the Nursing Outreach Endowed Fund. The Fund supports programs like Health Commons that provide health care and services to underserved communities, while also providing practicum sites for students. The Lester A. Dahlen Family Endowed Scholarship is a bountiful blessing. It rewards Augsburg University students’ hard work and provides financial assistance, while also assuring the family of Rev. Lester Dahlen that their family’s values will live on at Augsburg and be carried into the world. “As graduates go on to their lives after Augsburg, we hope they will be loving Christian people wherever they are and that they will touch whomever they can with the love of Jesus,” explains Barb (Dahlen) Cornell. A blessing today, the scholarship sprang from a family tragedy more than 50 years ago. 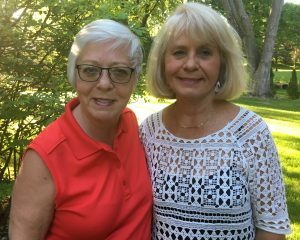 In 1966, when Barb was 18 and her sister, Ginny (Dahlen) Baali ’72, was 16, their brother Paul died in a plane crash with fellow Augsburg senior Jerry Pryd. Paul was pursuing a social studies major and physical education minor and, like his father before him, he played on the Auggie baseball team. To memorialize their son and highlight the importance of Augsburg to their family, Rev. Lester Dahlen ’39, ’42 and Marian Dahlen established the Paul Dahlen Memorial Scholarship to help students who had Christian purpose, demonstrated academic achievement and participated in extracurricular activities. “Our family’s connection to Augsburg started with Dad,” explains Barb, who supports the scholarship along with Ginny. A Minneapolis native, Rev. 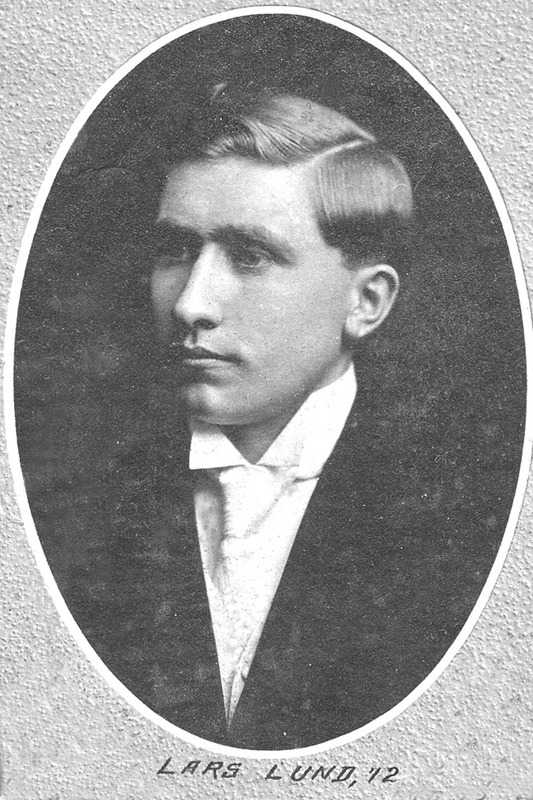 Dahlen enrolled in Augsburg in 1935 and quickly became involved in athletics, choir, student government and other organizations. “Augsburg helped prepare him for God’s calling and to be a man of faith and missions,” she continues. “Ever since we were little kids we heard about Augsburg from our dad,” remembers Barb. Rev. Dahlen often brought the family to concerts, games and other campus events and, in later years, he sometimes wore Paul’s letter jacket. He was grateful for his lasting friendships with Augsburg greats Leland Sateren ’35, Edor Nelson ’38, Ernie Anderson ’37, Sig Hjelmeland ’41 and others. After graduating from Augsburg Seminary, he served several parishes during the course of his 40-year career. The family did mission work in Taiwan and Hong Kong, and Rev. Dahlen also served as Lutheran Free Church Director of World Missions and staff member of the American Lutheran Church Division of World missions. “Augsburg was in his heart always,” remembers Barb. Their mother also held Augsburg in high regard: Marian worked in the financial aid office and joined the Augsburg Associates to provide volunteer support. When Marian passed in 2003, memorial gifts boosted the scholarship fund. When Rev. 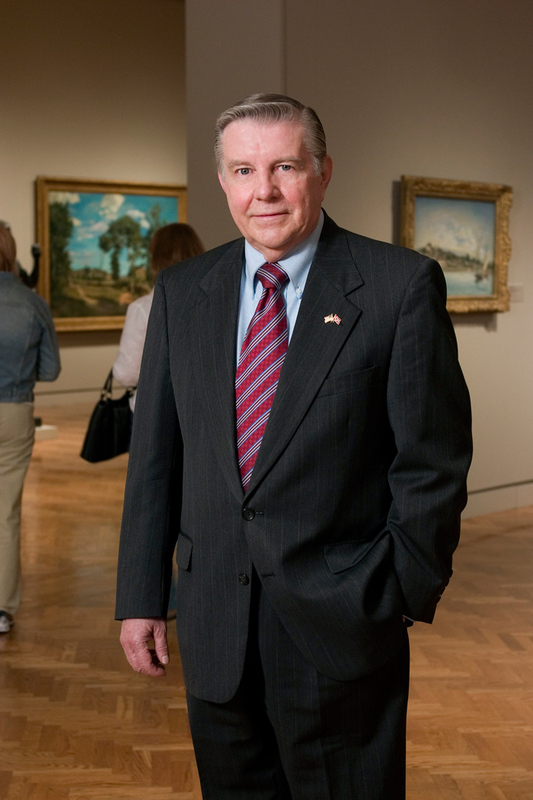 Dahlen passed in 2012, a portion of his estate and memorial gifts further augmented the fund. Around that time Ginny and Barb fine-tuned the scholarship criteria to clarify their parents’ intent and more closely represent their family’s values. “Barb and I have continued to be representatives of the scholarship,” explains Ginny, who supports other Augsburg programs in addition to the family fund. The scholarship gives priority to students who are involved in campus ministry and pursuing a major or minor in physical education, and who demonstrate financial need and academic achievement. “People who have a faith background should come to the school and be blessed by it,” says Barb. “I guess you could say that if it weren’t for Augsburg, I wouldn’t be here,” said Joe (Orville C.) Hognander, Jr. with a chuckle. 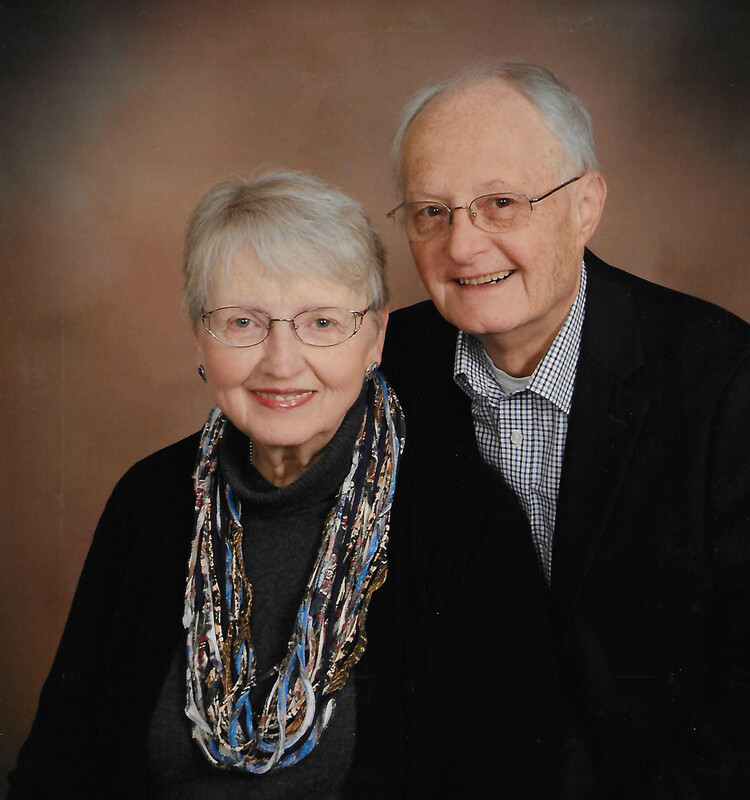 The retired naval officer and private investor has deep Augsburg roots: his grandfather, Reverend Lars R. Lund, graduated from Augsburg Seminary in 1912 and his parents, Gertrude Lund and Orville Hognander, met during their Augsburg Class of 1936 freshman registration. 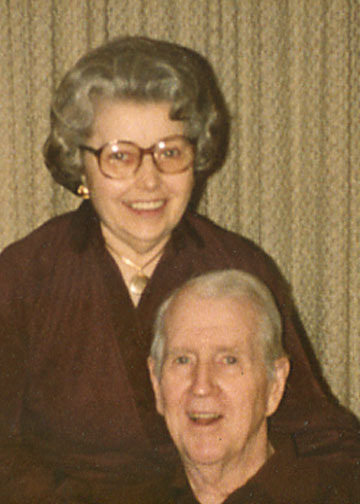 Gertrude and Orville shared a lifelong love of music. Gertrude began playing the piano when she was five and subsequently played the organ in her father’s church while still in her teens. Orville, who also grew up surrounded by church music, supported his dad’s ministry by serving as announcer for the family’s weekly WDGY radio program of music and the spoken word. Joe recalls hearing classical music regularly in their home, especially from their complete collection of New York Philharmonic Orchestra’s 78 RPM records in the pre-FM radio days. While students at Augsburg, both Gertrude and Orville were deeply involved in the newly formed choir, Gertrude as piano accompanist and Orville as the announcer/business manager. Most notably in 1935, he created and produced the “Hour Melodious,” a weekly radio program on WCCO featuring the 50-member choir. He also planned and arranged the choir’s first tour, which covered 20 concerts and more than 2,000 miles. After Augsburg, the Hognanders served their communities in many ways. Gertrude became a teacher and music education supervisor in Escanaba, Michigan, before marrying Orville and moving to Minneapolis in the early 1940’s. She became organist and director of several church choirs and joined, among other groups, AAUW, the St. Louis Park Woman’s Cub, and the United Nations Association of Minnesota, eventually becoming president of those associations. In 1973, she received Augsburg’s Distinguished Alumni Award. 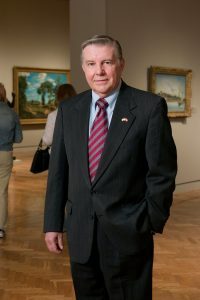 Orville began work for the Tennant Company as a salesman in the Detroit area, advancing rapidly to become vice president at age 31 and member of the Board of Directors eight years later. At the same time, he rose through the ranks of the National Sales Executives, becoming vice chairman in the early 1950’s. Sadly, at age 43 he suffered a major stroke that paralyzed his right side and required him to re-learn how to walk, talk, and write. 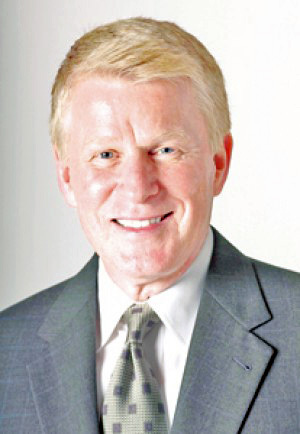 Through great determination, he succeeded and was able to resume his responsibilities at Tennant, where he negotiated foreign business agreements that opened markets in Europe and Japan. Joe (Orville C.) Hognander Jr.
Joe recalls how his father gave great thought to where his money should go when he was no longer here. It was a difficult decision but in the end he chose to support those organizations and causes that had been of greatest importance to him during his life. After he died in 1997, his will provided money to Augsburg College to create the Orville and Gertrude Hognander Endowment Fund, which specifies full tuition funding for an outstanding junior and senior in the Music Department. The department faculty selects the recipient based on past performance during their freshman and sophomore years at Augsburg or another college as well as their potential for future distinction. The foundation for the career success and generosity of John Schwartz ’67 was laid early, in Lester Prairie, then a town of 1,000, 50 miles west of the Twin Cities. There, long before he pledged a substantial estate gift to fund Augsburg’s choral music, he grew up in a musical family, singing and playing piano, pipe organ, and percussion. There, to keep school activities such as student government, sports, band, and theater alive, everyone had to participate. And it was there that his parents seeded his commitment to education, hard work, mutual respect, and philanthropy. “My father valued education because he never had it,” Schwartz says. His father, Norman, was in 8th grade when his mother died in childbirth; he quit school to help raise four younger siblings. But he was ambitious and built a life as a farm implement dealer, bulk propane distributor, inventor, and manufacturer. Buyers for his patented tip-down truck bed came from as far away as Oregon, Schwartz discovered years later while working there. “When I was in high school, he told me that I should get a business degree because it prepares you for many things,” recalls Schwartz. He remembers sitting at the kitchen table one morning while his mother read a “hot jobs” article in the newspaper. “She told me that hospital administration was one of them. So when I took my ACT test and had to put down my future goal, I wrote ‘hospital administrator.’” The ACT supervisor saw it and scoffed aloud; formally educated hospital administrators were rare then, and what kind of young person would choose such a career anyway? A determined one, apparently. 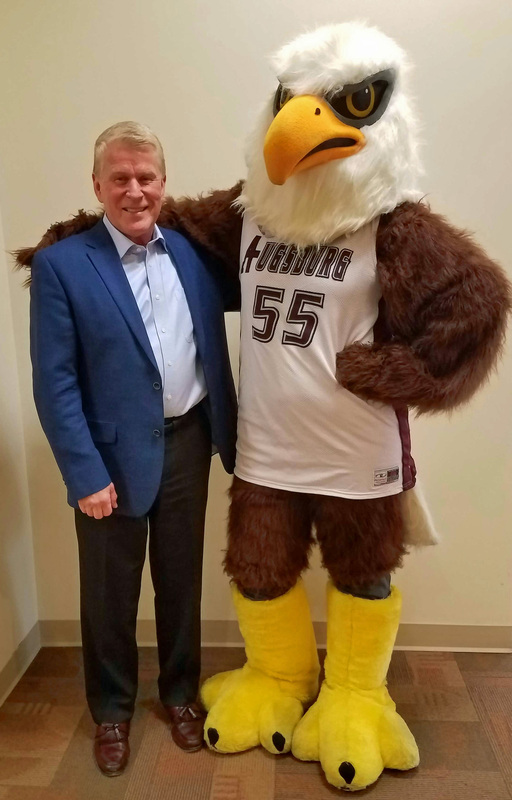 John Schwartz on campus with Auggie Eagle in February. 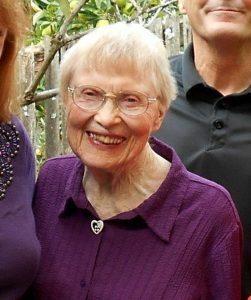 It took just one year for Augsburg to make its indelible mark on Marlys Morland ‘54, who has pledged a sizeable increase to the Marlys B. and Robert Backlund Morland Scholarship, established in 2011 as part of the couple’s estate plan. One thing she remembers about her year at Augsburg was a dentist’s visit to her health class, where he had to listen to student complaints about rising dental care costs. Coincidentally, she had to have three wisdom teeth removed that summer. The $150 bill meant that she had to drop out of school, even though she was working 20 hours a week at Swedish Hospital, making 93 cents an hour. “I found out partway through the year that other college students only got 76 cents an hour, so I was lucky. But I never got a penny from my parents—they couldn’t afford it—and I knew I wasn’t going to be able to go back to school,” she says. 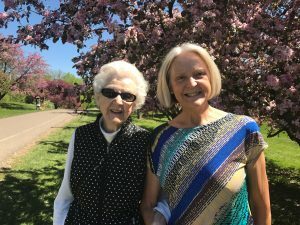 Instead, she took a national Lutheran youth leader’s advice to move to Helena, Montana, where she discovered her love for working with young people and also taught adult Bible classes. She went on to become a parish worker in Portland, Oregon, where she met her husband. The couple settled in Newberg, Oregon, in 1971. When the youngest of their three children entered school, Marlys finished her degree at Portland State University and taught elementary and junior high school for 25 years. She retired early to travel with her husband, Robert, until he died in 2008. Marlys notes how much Augsburg and its student population have changed. She grew up near Alexandria in Holmes City, population 65, where “we went to the Swedish Lutheran Church. We knew people who went to the Norwegian Lutheran Church, and some who went to the Finnish Lutheran Church, but we thought the Germans were really different,” she recalls. Whether in the world of commerce or philanthropy, Chris Purcell ’10 is not one to waste time. Since graduating, he has already tackled three big jobs, enough to preoccupy any young mover and shaker. Yet giving back has also been front and center, and he has had the foresight to designate life insurance policy proceeds to fund a full-ride scholarship for a future Auggie. Purcell works for Amazon, most recently in Seattle as a buyer on the men’s fashion team, but soon in New York City as an advertising strategist. Amazon recruited him from Target, where he worked after a stint handling mergers and acquisitions for a now-defunct Minneapolis investment bank. “I saw myself going out to Wall Street, so I started out as a finance major and then added economics,” says Purcell, who grew up in Northfield, the son of a carpenter and a middle school math teacher who strongly encouraged his educational aspirations. Recruited as a baseball player and the recipient of a Regents’ Scholarship, he loved moving to the big city and finding such a diverse, inclusive community within it. “Augsburg feels much bigger than what it really is. You have a very small community right there on that three-square-block campus, but so much is going on all around you,” he says. He also discovered “phenomenal professors” such as Keith Gilsdorf and Stella Hofrenning, found a “very inspirational mentor” in Marc McIntosh, and treasures the formative advice he received from baseball coach Keith Bateman. His insurance gift will help a future student, preferably a baseball player with an interest in business, learn to navigate obstacles like the ones Purcell encountered when trying to break into the post-recession job market. Despite the bleak prospects, professors, mentor and coach urged him to keep fighting until he found something. That is exactly what he did. Paul and Diane Jacobson at Redeemer Lutheran. 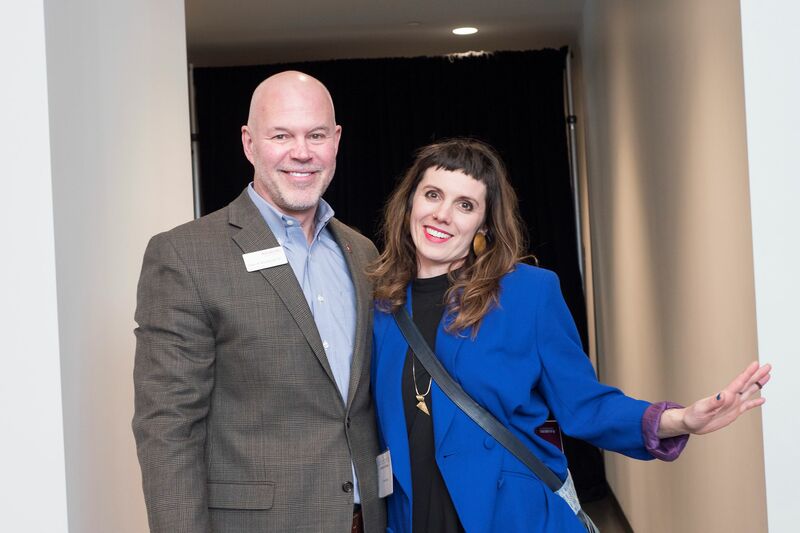 As a young girl raised Jewish in St. Louis, Missouri, Diane Levy Jacobson never imagined that she and her husband, Paul, might one day endow a scholarship for a Muslim student at Augsburg. But then she never imagined that she would teach Scripture, either. Or become a Christian, for that matter. “Becoming a Lutheran biblical professor was certainly not in my life plan while I was growing up, and I’m sure I had no idea what a seminary was. God has a great sense of humor,” says Diane, professor emeritus at Luther Seminary, St. Paul, where she taught from 1982 to 2010. By the time she got to Connecticut College, in New London, Connecticut, she decided to major in religion. Times were turbulent, and what was then a liberal protestant church championed civil rights and antiwar causes. Diane earned a master’s degree in religion from Columbia University and a doctorate from Union Theological Seminary, where she met and married Paul Jacobson, a St. Olaf graduate and son of a Lutheran pastor. They attended a Lutheran church, where she taught Sunday school, yet she remained Jewish “because it seemed wrong not to.” A change of heart had occurred by the time her second son was born; she and her sons were baptized together. “Then I became a super Lutheran,” she says with a chuckle. Diane was called to teach at Luther, so the family moved to Minnesota in 1982, where Paul pursued his music career as composer, flutist, and co-founder of the Lyra Baroque Orchestra. At Luther, Diane became the first woman to teach Bible at any Lutheran seminary in the country. A well-respected leader, frequent speaker, and author of numerous publications, she retired in February as director of the Book of Faith Initiative for the Evangelical Lutheran Church in America.